Made from the quality porcelain, this ingenious item has been designed to be both the perfect way of storing camembert – or of baking one in the oven with mouth watering results! It has a beautifully clean and classic design on the lid and comes with a recipe leaflet! Why not order a Cheese for your Cheese baker here? Why not add some nice Cheese plates? 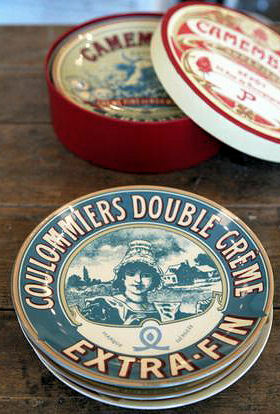 These Cheese plates are decorated with colourful & charming Vintage French cheese labels. The set of four 20cm, 8" plates is packed in its own decorated gift box. Oh, and don't forget to order a nice Cheese selection! These plates are Microwave, Dishwasher and Warm Oven Safe.